This post shows you how to configure SSH password less login authentication for users on Linux Servers. SSH (Secure Shell) is a default protocol used to connect linux server remotely with valid users credentials (Username and Password). Enabling SSH password less authentication helps us to perform some automated tasks using scripts or to avoid entering username and passwords for everytime. Lets see how to enable password less login authentication. Let's take an example to enable SSH password less login authentication from node1.learnitguide.net (Source Server) to node2.learnitguide.net (Target Server). 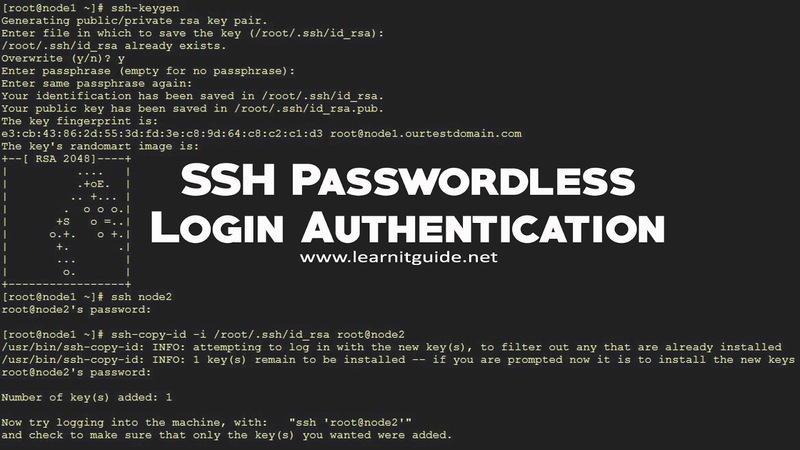 Also Watch this "SSH password less login" Tutorial video on our YouTube Channel. Login into "node1.learnitguide.net" with user (root) from which you try to connect to target or destination server (node2.learnitguide.net). Once you have logged in and use ssh-keygen command. ssh-keygen is a tool available default in linux used to create a ssh authentication key pairs. ssh-keygen can create RSA keys, DSA keys, ECDSA keys, ED25519 keys. By default, ssh-keygen will generate an RSA key pairs with one public and private key. If you want to generate any other type of keys (DSA keys, ECDSA keys, ED25519 keys), it must be specified with -t option along with ssh-keygen command. (ssh-keygen -t dsa). For this example, I just go with rsa key hence I use ssh-keygen command without any arguments. Once you have executed ssh-keygen command, it is generated a private and public key pairs under the home directory of user by whom you have executed the ssh-keygen command. where, id_rsa is a private key with RSA encryption and id_rsa.pub is a public key with RSA encryption. 2. Use ssh-copy-id command to add remotely with "-i" option by specifying the public key to be copied. We recommend to use ssh-copy-id command to avoid any human errors. Now try logging into the machine, with: "ssh 'root@node2.learnitguide.net'"
Public key is added to target server. From node1 server, Try login into node2 target server to check password less login authentication is working or not. Great. We are able to login to target server from source server without password prompt. 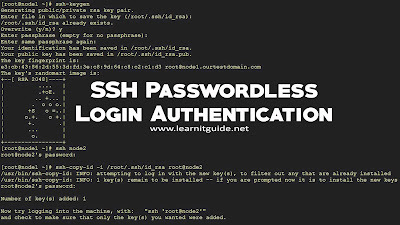 So SSH password less login authentication is enabled as expected Similarly, you can configure SSH password less authentication between a source server to any number of target servers.